People slightly familiar with China and/or Japan will know that many Chinese and Japanese men hate to be hugged, and might flinch if it happens, but neither Chang nor South Korea’s Chosun Ilbo could apparently resist the temptation. 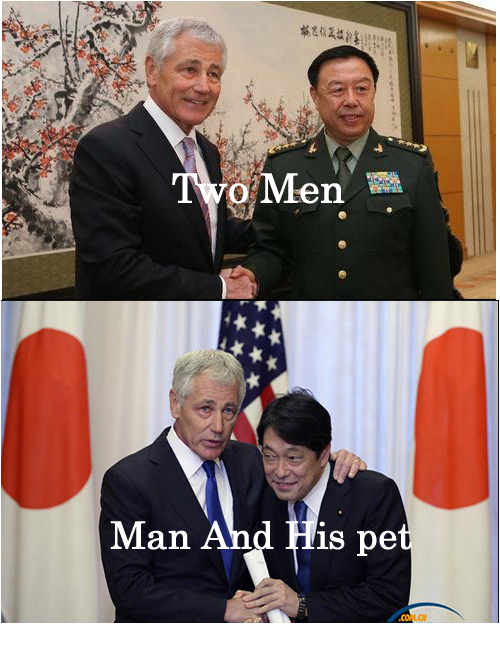 At least, the South Koreans didn’t openly doubt Onodera’s manhood: U.S. Secretary of Defense Chuck Hagel (left) chats with Japanese Defense Minister Itsunori Onodera ahead of a meeting with Japanese Prime Minister Shinzo Abe. But my dear JR, you are quite mistaken because my two photos are about relationships, not about manhood. South Korea is yet another “pet”. The two countries are colonies of the United States, both militarily and economically, though in a loose sense. No normal country will allow any other to dictate military and economic terms. But South Korea and Japan happily do. However, while South Korea is content with this arrangement, Japan is impatient to break away from the post-WWII world order imposed on it as a defeated country by the United States, including its pacifist Constitution Abe is determined to scrap. After the United States loses control of Japan, which is quite likely considering the train of events in recent years, the two countries can again stand on equal terms. I’m sure neither China nor the United States will like this prospect. For China, it’s better to see a Japan under control of the United States. But things just happen when they reach the critical point: both Japan and China want to change the post-war world order in their favor. For Japan, it is to achieve real independence. For China, it is to regain what it’s long lost – the position of being the world’s number one which can enjoy almost all the superlatives a language can offer. While Obama said that “the U.S. will lead the world for the next 100 years“, we can as well keep this topic open in our life time, for example, for the next 30 – 40 years, if I could live that long, which I hope I can do. Sorry I keep editing this post. I mean Japan and America. In the EU, Germany and France dictate all the terms. In the West, the United States dictate all the terms. In the world, the West dictate all the terms. However, there are quite a few players that might change the status quo in the next 100 years: the EU, Russia, India, China, and perhaps Brazil. I completely rule out Japan because it’s inherently an island country and the historical mistake will be corrected. Others that have already been corrected include the Netherlands, Portugal, Spain, and Britain.